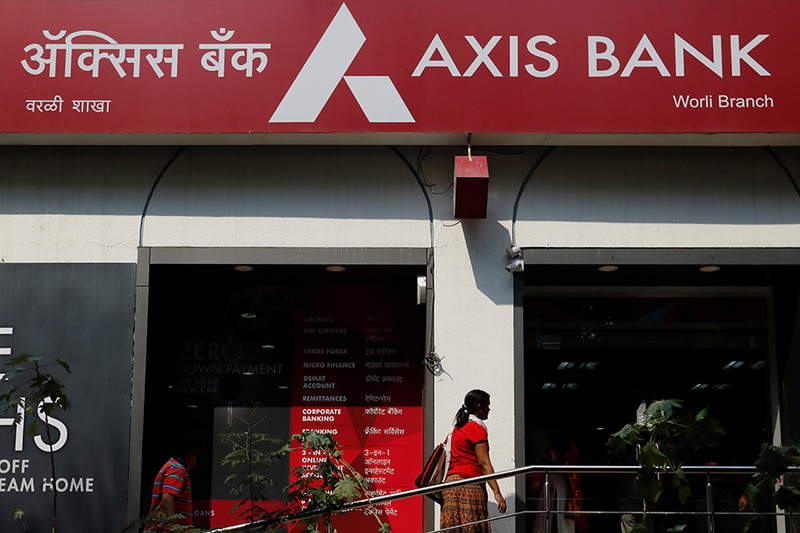 Axis Bank, country's third largest private sector lender, reported loss of Rs 2,188. 74 crore for the fourth quarter of FY18. The bank had posted profit of Rs 1,225 crore in the same quarter last year. This is the first ever quarterly loss posted by Axis Bank since it listed over two decades ago. Slippages for the quarter nearly quadrupled YoY to Rs 16,536 crore with nearly Rs 13,900 crore of new slippages coming from the corporate sector. So, more than 80 percent of slippages were from BB and below rated companies. The bank said loans to the power sector amounted to Rs 9,000 crore and 40 percent of these loans were NPAs. Net interest income (NII) – difference between interest earned and expended – was flat at Rs 4,730 crore in Q4FY18. In Q4FY17 NII was at Rs 4,728.60 crore. A Reuters analyst poll had estimated a decline of 56 percent in profit to Rs 534 crore. The poll estimated NII to rise a marginal four percent to Rs 4,909 crore. Gross non-performing assets (NPAs) during the quarter deteriorated to Rs 34,248. 64 crore, at 6.77 percent of total loans. Gross bad loans had increased in Q3 ending December 2017 at 5.28 percent, and at 5.04 percent as on March end last year. Net NPAs jumped 41 percent QoQ to Rs 16,591.71 crore, at 3.4 percent of total loans. Net NPA was at 2.56 percent in December 2017. In the year ago period, net NPAs were at 2.11 percent as on March end 2017. Provisions were at Rs 7.179. 53 crore from Rs 2,581.25 crore in March quarter last year. "Recent regulatory guidelines forced us to recognise other accounts as bad loans," said MD and CEO Shikha Sharma in a results conference. "Credit risks have been a disappointment for the bank and our focus now is normalisation of these risks," she said, adding, "It was important to complete the NPA recognition process. Now we can say this is the end of the recognition process." The private lender has been grabbing news headlines for the wrong reasons in the past few months given its deteriorating financial performance under the leadership of Shikha Sharma. Earlier this month, Sharma's tenure was shortened by the bank's Board, on Reserve Bank of India's interference, from three years to seven months ending December 2018. Sharma said she is confident the Board will find the right person to take the leadership of the bank. "I will cooperate in the transition. I am sure, it is an exciting time for anyone to take over the job (on new CEO). We should not get bogged down with short term challenges and work toward the future," she said. Jairam Sridharan, CFO of Axis Bank said, NPA recognition cycle is nearly through with this quarter. "Our watchlist is closed with the end of this quarter and will no longer exist,"he said. We believe the new NPA formation in this financial year will be significantly lower. We continue to expect loan growth in the high teens (over 15 percent), Sridharan said. He said the bank will look at stable to upward projection in net interest margins (NIMs). The bank is confident about its capital requirement for the next two years. “At least two years of growth can be funded by our current capital,” he said. For FY19, the bank has charted a four-step plan comprising normalisation of credit risk, delivering profitable growth, enhancing capabilities and investing in the future, Sharma said. On resolution under insolvency Sharma said, "I wouldn't worry about the couple of months delay in the resolution, the law is remarkable and eventually will see resolution. About 60-65 percent hair cut can be expected overall." The story first appeared here.